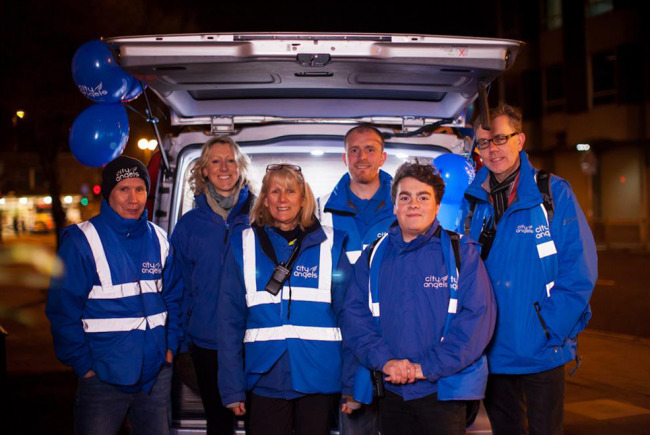 City Angels are 65 local volunteers who aim to bring a calming presence to the streets of Chichester every Friday night, and two Saturday nights a month. They reduce crime and help anyone in need. City Angels are 65 amazing volunteers aged 8-80+, who give up their time to work late into the night in all weathers, helping local people in need. They significantly reduce city centre crime and anti-social behaviour, and bring a calming presence to the city centre. City Angels have helped reduce acts of violence by 67%, and anti social behaviour by 58% (Sussex Police Crime Data). 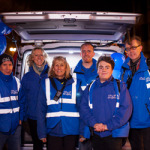 Teams of 6-8 volunteers engage in street outreach every Friday and currently the first and last Saturdays of the month (to coincide with pay day) from 10:30pm until 2am or later. Whilst on the streets City Angels work in close partnership with other organisations, including Sussex Police, CCTV, and Door Security Staff. City Angels give out free hot drinks from a mobile coffee van, and administer items such as flip flops (to save bare feet from glass on the streets when people take off their high heels at the end of the night); water; space blankets; and basic First Aid. We will continue to help anyone in need on the streets of Chichester. We will continue to bring a calming presence on Friday and Saturday nights. We will continue to give out free hot drinks from our mobile coffee van. This project is essential in Chichester, as we have been proven to help lower crime and, for example, reduce alcohol related admissions to A+E by 61%, thus saving precious Police and NHS time and resources. 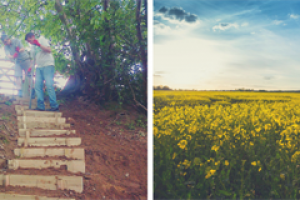 Between 2011 and 2016 City Angels helped over 60 people who they found unconscious or injured, (often having alcohol-related seizures) on the streets - if some of these people had not been found by City Angels I am sure lives would have been lost. City Angels were involved in 182 incidences over a 5 year period that required police intervention; and helped 521 people who were drunk and very vulnerable. City Angels also pick up cans, bottles and sweep broken glass from the streets - nearly 6000 bottles/cans over 5 years! Giving out free hot drinks (over 12,000 2011-2016) helps people who may have had too much alcohol, and calms potentially volatile individuals - it's hard to be aggressive if someone has just given you a free hot chocolate and is talking to you in a calming manner! The mobile coffee van currently needs substantial work to enable City Angels to offer free hot drinks to the public. City Angels volunteers also attend a monthly Rough Sleepers Panel Meeting, as we support rough sleepers and collect statistics regarding numbers and locality which are useful to local homeless services. City Angels were presented with a Community Award by Chichester City Council this year; and have previously won an award from Sussex Police for outstanding partnership working. We endeavour to meet the changing needs of the community, and regularly meet with police and other agencies to review identified needs and adapt our project accordingly. One local man said of City Angels: "These guys are great - I can't count how many times I've been ready to punch someone's face in then stopped here (at the coffee van) and when I leave, I don't want to anymore." Project Delivery Manager: City Angels The Project Delivery Manager takes legal responsibility for receiving and spending the funds raised and ensuring the project is delivered.